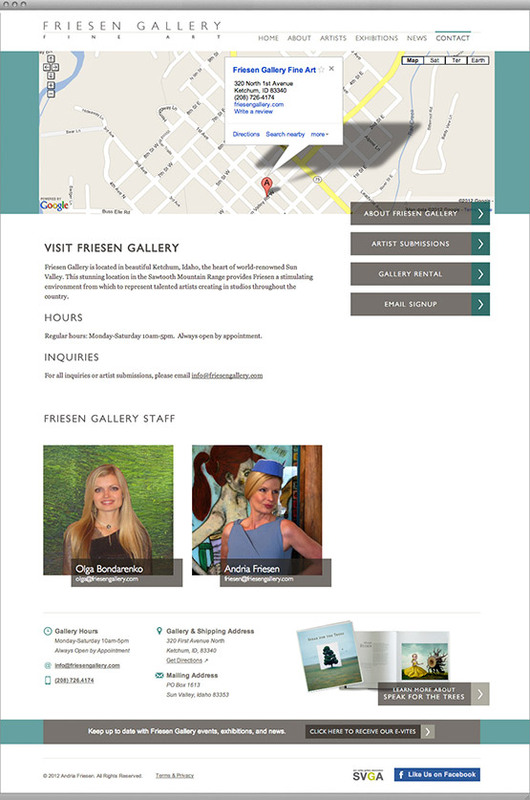 For the past 25 years, Friesen Gallery has been a premiere gallery in Sun Valley, Idaho, exclusively exhibiting contemporary paintings, glass and sculpture. When they were ready to develop and design a new website to showcase the gallery, they knew they wanted to work with Creative Soapbox. 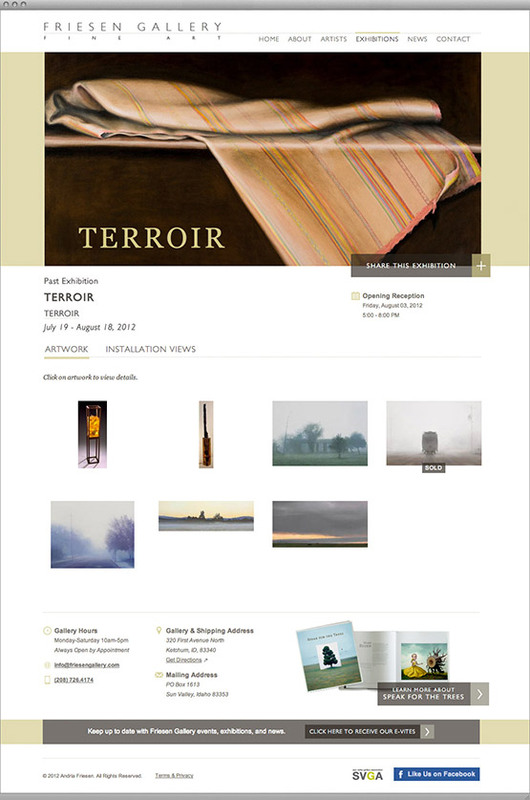 Having already worked with Friesen Gallery on http://speakforthetreesbook.com, we knew we had their confidence that we could work together to bring their unique vision to life. We started the process by researching top gallery sites. From there we creating greybox wireframes of the main sections of the site. And then created Photoshop mockups of the main pages. For each new exhibition, the Friesen Gallery paints the walls and changes the layout of the movable walls to fit the exhibition. We wanted the website to reflect this attention to detail. The overall design of the site is very clean, much like bare gallery walls. We wanted the artwork to be front and center. However, the background color, icon color and other accents can be customized per exhibition and per artist. 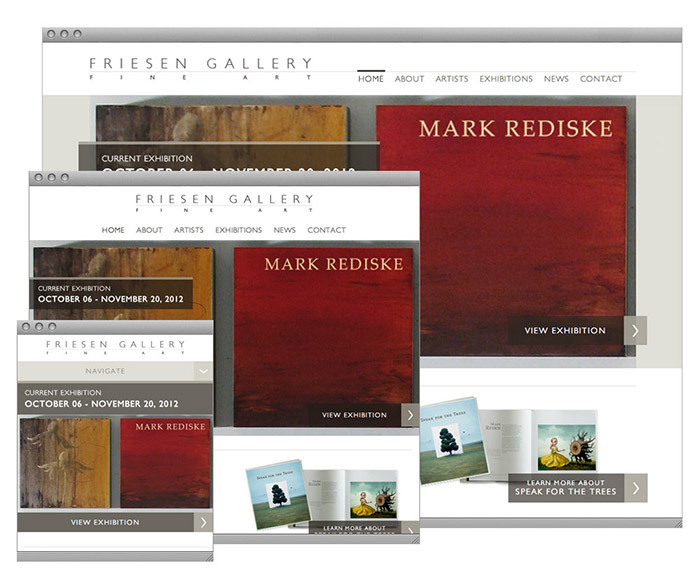 Friesen Gallery also wanted to transition to a new gallery management software and asked us to research their options. After carefully weighing the candidates, we suggested ArtLogic. The ArtLogic system is robust and forward-thinking. In addition to the myriad features it has to manage artworks, the system offers a way to integrate the information managed in their "back-end" system to the "front-end" of the website. ArtLogic provides this information via "feeds" and we built a custom solution that digests these feeds and saves them to a database. This information can then be displayed on the website. This means that Friesen Gallery staff will only have to update the artwork in one place when it sells. Because of this custom functionality and ability to customize the admin panel, we chose the web framework Django to power the site. 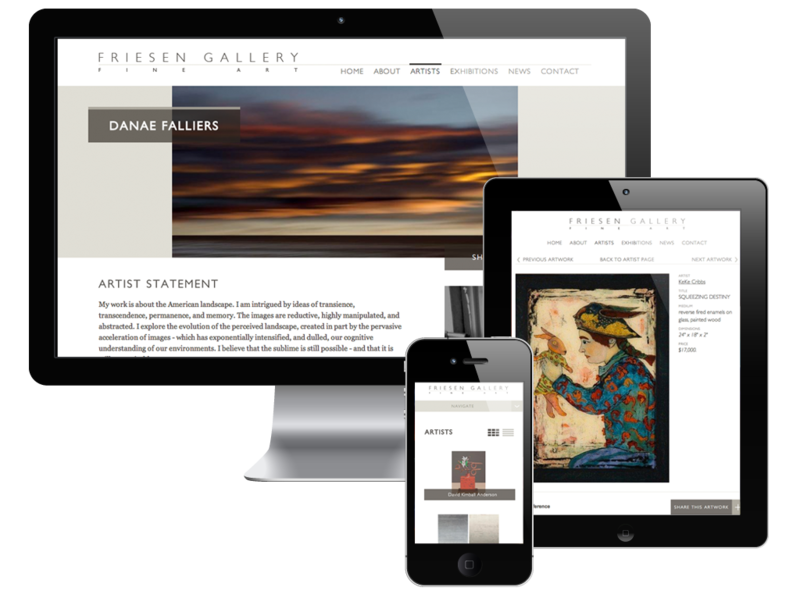 Django allowed us to quickly build the system and customize it to fit the needs of Friesen Gallery. Friesen Gallery customers have the means to consider purchasing high-end artwork. It is likely they have a smartphone or tablet. Considering this demographic, we thought it was important to tailor the site to this probable user. We used a technique called Responsive Design, or designing and building a site to adapt to different screen sizes and mobile devices. We took a "mobile first" approach, starting by making the site look and perform well on smartphone-size screens, then gradually rearranging content and adding functionality as the screen size grew.